Thank you for participating this year at ALL-CON, "Your Favorite Con!" ... since 2005. 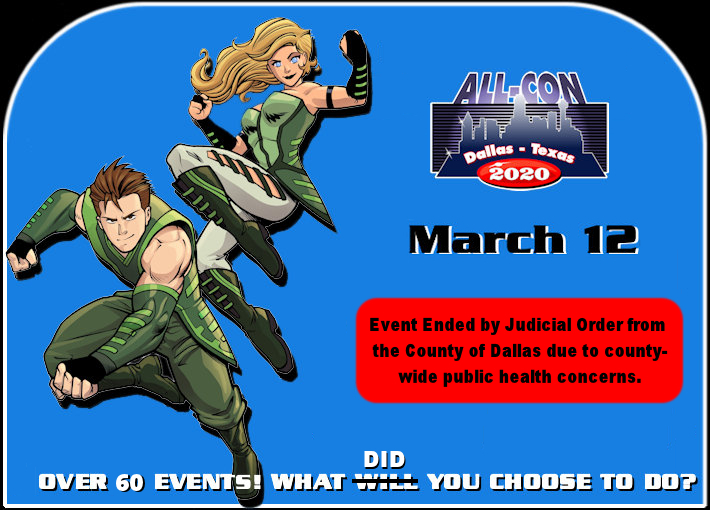 This year we are at the Crowne Plaza Hotel in Addison, Texas (14315 Midway Rd, Addison, TX 75001 Phone: 972-980-8877) which has been a home to ALL-CON since 2007. It a convention-friendly hotel with great staff and quality facilities. Thursday is a badge-free day, open to the public, to encourage the convention-curious who do not normally attend to come and check out a full day of our event without any admission cost. This results in additional sales from customers who will not be present the three remaining days, and makes it worth everyone’s while to not miss opening day. Free Day Thursday started in 2012 and is comparable to a Saturday in terms of attendance. Please keep in mind, there are no alcoholic beverages, drinks, or food allowed in hallways or convention space. Please limit these to your hotel room, restaurant or bar area. This also includes a policy of not having food or beverage items available for display or for sale, per our hotel contract. This move-in document is divided into two sections... VENDOR ROOM and EXHIBITOR HALLS. 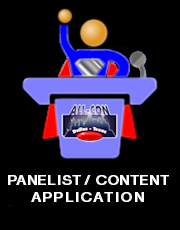 We take the guesswork out of your convention experience at ALL-CON. Vendors Room open hours for Thursday are 3pm until 7pm, Friday and Saturday are 11am until 7pm, and Sunday 11am until 5pm. 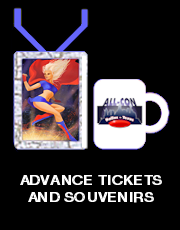 Vendor Room access hours are from 9am until 7:30pm Thursday through Saturday. Please plan to be out by 7:30 so we can lock up for the night. Sunday, once the room closes at 5pm the hotel has expectations that the ballroom will be fully vacated by 8:30pm. Nightly, once the room is locked, vendors are not permitted back into the room until the next morning. Make sure you take everything with you when you exit for the night. For those of you that are night-owls anxious to get moved in, the hotel has agreed to open the ballroom for us at 10pm on Wednesday until 12 midnight. You will want to come up and investigate the ballroom before unloading if you plan to take advantage of Wednesday night. One year we were told that they would open the ballroom early and only half of the tables were set-up. Since this is a courtesy of the hotel, we ask for patience and understanding if there's a delay for Wednesday night set-up. The Trinity Ballroom will be locked down at 12 midnight on Wednesday. That way we can all get some sleep. You may want to load-in on Wednesday night and unpack on Thursday while others attempt to load-in in the morning. This will also reduce congestion in the loading dock on Thursday morning. The main set-up is Thursday from 9am until 3pm. Please park on the south side of the parking garages and check-in BEFORE approaching the loading dock area. Wednesday night (10pm-12am) you can check-in at the Trinity Ballroom to pick up the badges for your booth. Starting Thursday you can check in at the convention registration desk in the main lobby of the hotel. 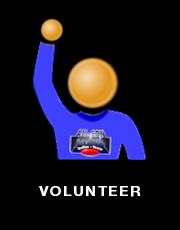 The registration packet is under the name of the individual who paid for the booth and photo ID will be required. If you arrive after opening on Thursday, for safety and security we recommend Friday morning, 9am-11am for load-in or replenishment. The loading dock can only accommodate one large vehicle at time if you back up directly to it. Please plan to empty and remove your vehicle within minutes so others may also unload. In the past we have discovered that if you park 'around' the dock instead of 'at' it, you should be able to accommodate several vehicles at once. 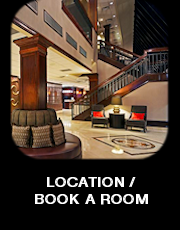 From the loading dock you enter the dish cleaning portion of the hotel and to the medium sized freight elevator which takes you up one floor to a kitchen staging area and then through any one of three *** single width, standard-sized *** doors and into the Trinity Ballroom. Some of the passages are narrow, so walking the load-in path first before loading carts is advisable. There is only ONE freight elevator. Every booth comes with at least one table and 2 chairs. The table is covered but not skirted. If hotel linen isn't your thing, you're welcome to re-cover. You paid for floor space (8'x8' or 8’x16’); not just a table. If you would like an extra table, or to remove your table in favor of your own displays, you are welcome to. There are extra tables and chairs in the room to accommodate nearly every need. Please do NOT borrow pieces from the Celebrity booths. We will have staff on hand to help you locate any extra pieces you might want or haul away parts you don't. The booths are butted up against each other. Please respect your own space and that of others. Some of the ballroom doors will remain locked during the convention. For security reasons, please do not use these doors (even if it’s a shortcut). All traffic needs to use specific doors during the convention. Back of house is only to be used for load-in and load-out. Back of house access is not permitted during the convention. You will receive a packet at check-in that includes lunch menus for your use. We encourage you to use the ‘room-service’ type arrangement. Hotel staff will be around before meal time to pick-up your orders, take payment for your meal, and deliver it directly to your booth. Unlike typical hotel fare, the Vendor lunches are designed to be a balanced lunch at a convention-friendly price point and the low cost includes beverage, plus all taxes and gratuities. You may pick up your registration packet in the Trinity Ballroom Wednesday evening 7pm - 10pm. Starting Thursday morning your registration packet will be available for pick-up at the convention registration desk in the north lobby, across the lobby from the hotel’s front desk. The packet is under the name of the individual who purchased the table and photo ID is required to pick it up. The 6'x30" tables are set approximately 4 feet from the wall or railing and come covered, skirted, and with two chairs. Some tables are near wall outlets. As a reminder, if you plug into an outlet and did not order the power you will owe a $60 power fee for the weekend. This is in the contract with the hotel and not negotiable by the convention. For Thursday, table set-up is from 9am to 11am. Convention content runs from 10am until 2am. Most gallery exhibitors clear their table at 7pm for the day, which is officially when the gallery closes on the schedule, and we ask that you man your table until then. You are welcome to staff your table as long as you wish. Please be aware that neither ALL-CON nor the hotel is responsible for anything left on/under or around the tables. Gallery tables must be cleared every day and reset the next. If you have give-away literature, you're welcome to leave it. If you have product or items of any value, you must take it with you when you leave your table. Friday and Saturday the gallery set-up is from 8am until 10am. Convention content runs until 2am and again, 7pm is when the gallery officially closes on the schedule. We ask that you staff your table until then. Sunday the gallery set-up is from 8am until 10am. The convention runs until 5pm Sunday afternoon. Please plan to pack-up at 5pm and drive safely home. Some exhibitors have expressed concern about inability to staff their tables on Thursday. We understand that day jobs sometimes get into the way of convention fun. Your table will still be safely waiting for you on Friday morning when you arrive. ALL-CON does not recommend trying to set-up during active gallery hours. The gallery is VERY full and can be too busy to be moving in and out of tables during the convention.